These Six bottle Jute Wine Gift Bags are long in vertical and long lasting in nature. These jute wine gift bags are useful not only to hold bottle but also its display through transparent plastic attached on the front. Size/Dimension: 14" x 12" x 4"
With the help of our professionals, we have been able to offer our clients with Jute Gift Bag. Jute Wedding Gift Bag, Size: 9.5"x9"x5"
We have successfully achieved a reputed position in this industry by maintaining the quality of our entire product range. Our Plain Gift Bag looks very sophisticated and is very easy to carry. Our Plain Gift Bag has unique designs which give it classy appearance. They are made available at nominal prices in the market. 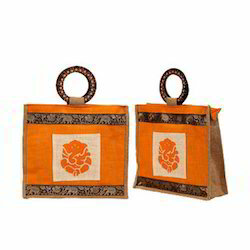 We are manufacturer of various Jute Gift Bags.It is ideal for any gifting purpose. Cute bags for gifting purpose. Drawstring and handles. One can avail from us a quality approved array of Jute Gift Bag. 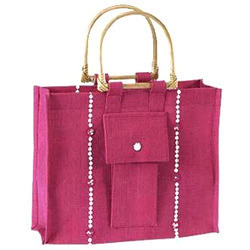 The Jute Gift Bag is known for their availability in various sizes and designs. Suitable for gifting purpose these products are known for their unique appearance. Moreover, we assure our clients that a quality assured assortment is delivered from our end.